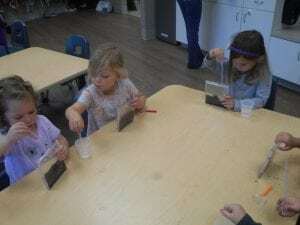 The Preschool A class at Park West is currently studying various types of plants. After spending some time investigating insects, the children showed interest in learning more about where insects live and the different trees growing outside our school. 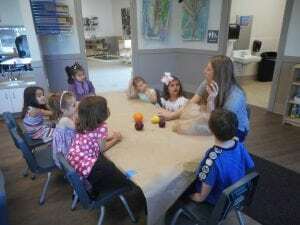 The children created the life cycle of a tree using clay and used canvas to represent the four main parts of a tree: roots, trunk, branches and leaves. They were even able to record their voices explaining each part! 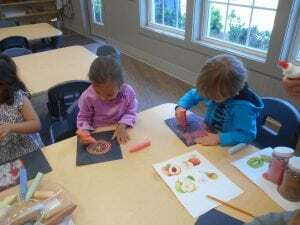 Our Preschool A class was surprised to find that many fruits we eat grow from trees. 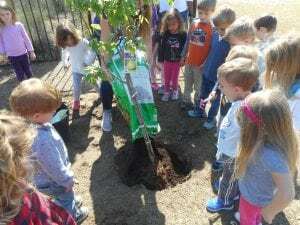 We were able to plant our own pear tree outside the school and dissected various fruits in order to investigate how they grow. We also had the opportunity to observe various trees in their natural environment by taking field trips to Angel Oak and Magnolia Plantation. And the class recently investigated fruits at the Boone Hall strawberry patch, too.